The Hyperomyzus picridis alate has a green abdomen with blackish green dorsal markings, mainly consisting of more or less broken cross bars. There are numerous secondary rhinaria on the antennae with 55-95 on the third antennal segment, 12-34 on the fourth, and 0-6 on the fifth. The clarified slide mounts below are of adult viviparous summer female Hyperomyzus picridis : wingless from the secondary host, and winged gynopara. 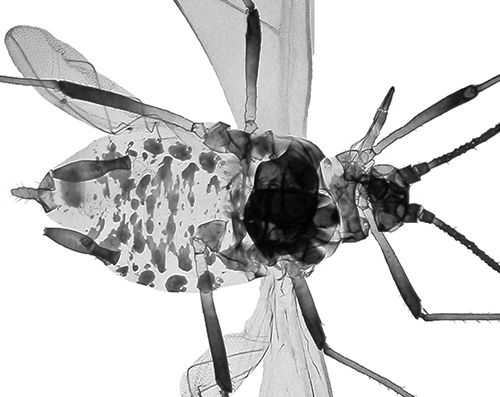 Micrograph of clarified mounts by permission of Roger Blackman, copyright AWP all rights reserved. The most remarkable aspect of the ecology of Hyperomyzus picridis is the extraordinary plant architecture that it lives amongst on Oxtongue (Picris echiodes) - numerous grapple-hook hairs that various authors describe as trapping a wide range of insects (see for example www.plantlives.com/docs/P/Picris_echiodes.pdf). It is these hairs that give rise to the common name for the plant of Oxtongue. 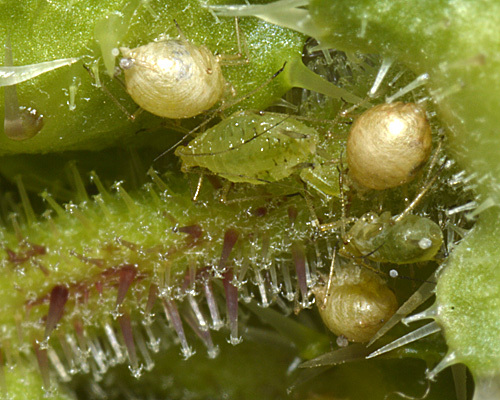 We have never come across an Oxtongue aphid trapped in these hairs - since Picris is their main food plant, we can assume they have evolved adequate means of avoidance - but it seems entirely possible that some predators and parasitoids may be trapped. Several authors report the observation of Hille Ris Lambers (1949) that colonies on Picris are usually fairly small and occur just beneath the inflorescences. 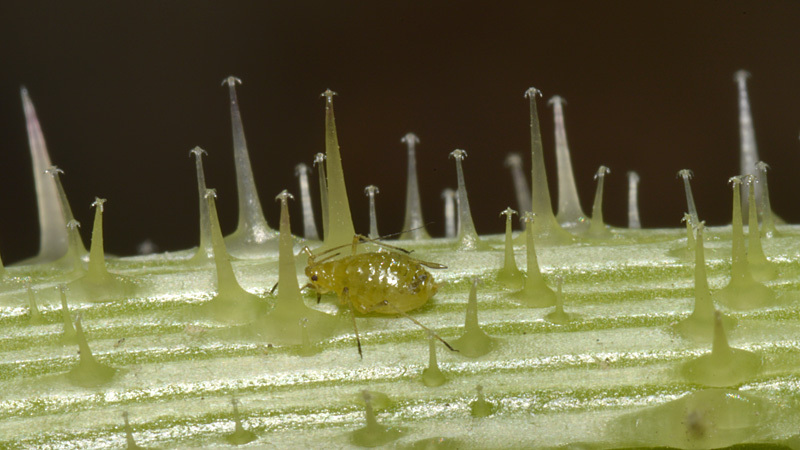 However, in several locations in Dorset and East Sussex we have observed large dense colonies of this aphid on both the stems and leaves of Picris (see above). As regards natural enemies, Hyperomyzus picridis is attacked by both parasitic braconids (see above first) and a bright orange fungal Entomophthora (see above second). Hyperomyzus picridis has been recorded on 9 Ribes species (including gooseberry, Ribes uva-crispa). Blackman & Eastop list 14 species of aphid as feeding on alpine currant (Ribes alpinum) worldwide, and provide formal identification keys. 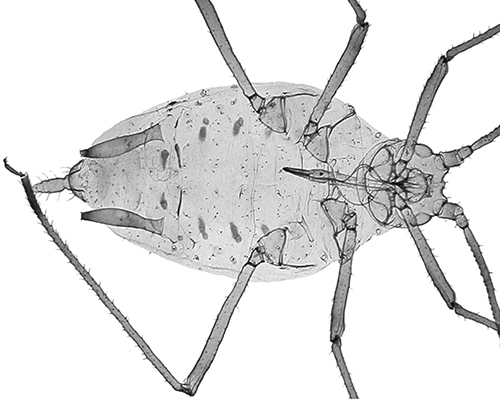 Of those aphid species, Baker (2015) lists 12 as occurring in Britain: Aphis grossulariae, Aphis schneideri, Aphis triglochinis, Cryptomyzus galeopsidis, Cryptomyzus korschelti, Eriosoma anncharlotteae, Hyperomyzus lactucae, Hyperomyzus pallidus, Hyperomyzus picridis, Hyperomyzus rhinanthi Hyperomyzus zirnitsi and Nasonovia ribisnigri. Blackman & Eastop list 26 species of aphid as feeding on Picris species worldwide, and provide formal identification keys. 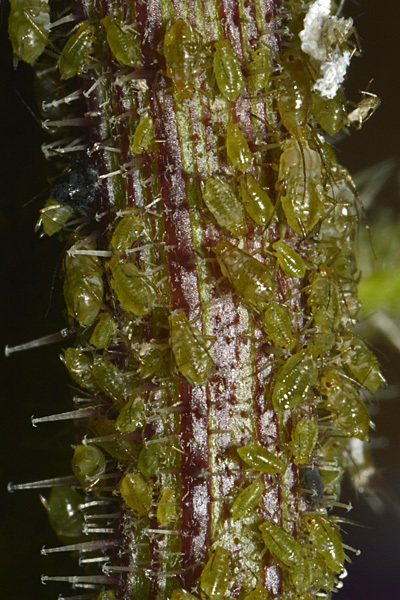 Of those aphid species, Baker (2015) lists 21 as occurring in Britain: Aphis craccivora, Aphis fabae, Aphis gossypii, Aphis nasturtii, Aulacorthum palustre, Brachycaudus helichrysi, Hyperomyzus lactucae, Hyperomyzus picridis, Macrosiphum euphorbiae, Myzus ornatus, Myzus persicae, Nasonovia ribisnigri, Pemphigus bursarius, Protaphis picridicola, Protaphis terricola, Trama caudata, Trama maritima, Trama troglodytes, Uroleucon cichorii, Uroleucon picridis and Uroleucon sonchi. Blackman & Eastop list 31 species of aphid as feeding on Crepis species worldwide, and provide formal identification keys. 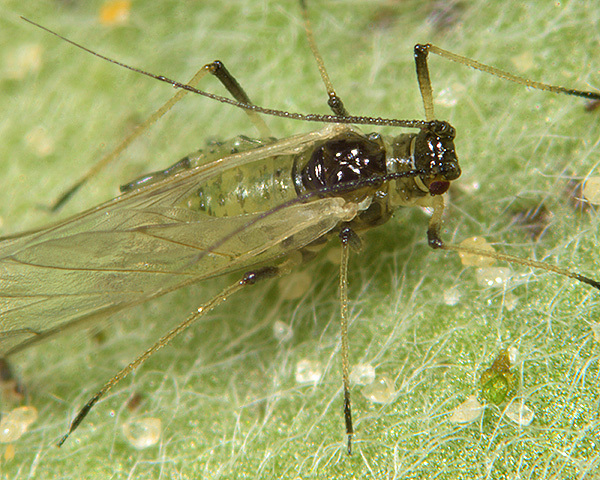 Of those aphid species, Baker (2015) lists 26 as occurring in Britain: Aphis crepidis, Aphis fabae, Aphis gossypii, Aphis nasturtii, Aulacorthum palustre, Aulacorthum solani, Brachycaudus cardui, Brachycaudus helichrysi, Hyperomyzus lactucae, Hyperomyzus picridis, Macrosiphum euphorbiae, Myzus ascalonicus, Myzus ornatus, Myzus persicae, Nasonovia ribisnigri, Pemphigus bursarius, Trama maritima, Trama troglodytes, Uroleucon cichorii, Uroleucon erigeronense, Uroleucon grossum, Uroleucon hypochoeridis, Uroleucon murale, Uroleucon picridis, Uroleucon riparium and Uroleucon sonchi. 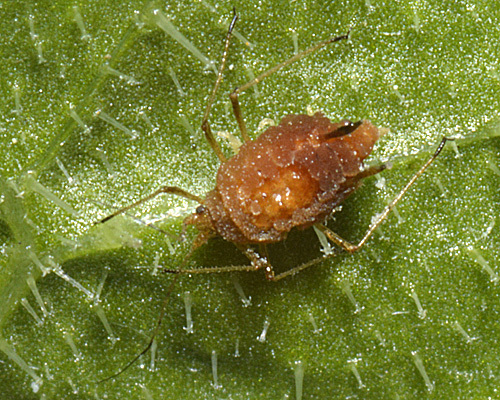 Blackman & Eastop list 5 species of aphid as feeding on Rhagadiolus stellatus worldwide, and provide formal identification keys. 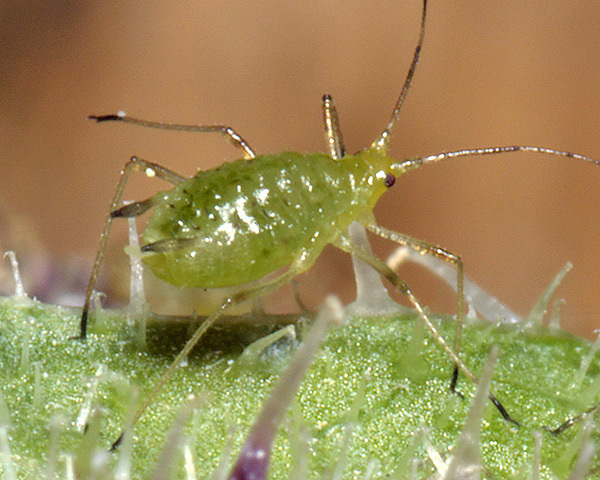 Of those aphid species, Baker (2015) lists 4 as occurring in Britain: Hyperomyzus lactucae, Hyperomyzus picridis, Uroleucon hypochoeridis and Uroleucon picridis. Hille Ris Lambers, D. (1949). Contributions to a monograph of the Aphididae of Europe. IV. Aulacorthum (part), Microlophium, Hyalopteroides, Idiopterus, Pentalonia, Amphorophora, Amphorosiphon, Wahlgreniella, Megoura, Megourella, Hyperomyzus, Nasonovia. Temminckia 8, 182-329.